PHOENIX/30,000 FT. OVER THE NORTH PACIFIC/TOKYO — I began my 36-hour journey from New York to Tokyo early Wednesday afternoon, grabbing a cab from MLB.com’s Manhattan office to JFK. With a four-hour hop on tap before Thursday’s half-day jump across the Pacific, winning the seat-next-to-the-only-unoccupied-seat-on-a-full-plane lottery seemed like a strong omen. Touching down at Sky Harbor around 6:30 local time, I looked forward to an hour or two of desert sun before learning that the state of Arizona doesn’t believe in Daylight Savings. Makes sense, who doesn’t want more darkness? I settled for dinner at Chinese restaurant within walking distance — prepping my palate for the Far East — and fully recommend it if you’re in Phoenix and craving mediocre chicken with broccoli. Thursday’s wakeup call came at 7:30 AM. An hour later, after a mix-up in which the hotel bellman “forgot” to schedule me a cab but “knew a car service in the area that would take me for the same price,” I rolled up to Phoenix Municipal Stadium in an enormous black Escalade. That might have turned a few heads if this wasn’t the meet-up spot for 25 professional athletes. Tyson Ross, Jerry Blevins breakfast on the bleachers. 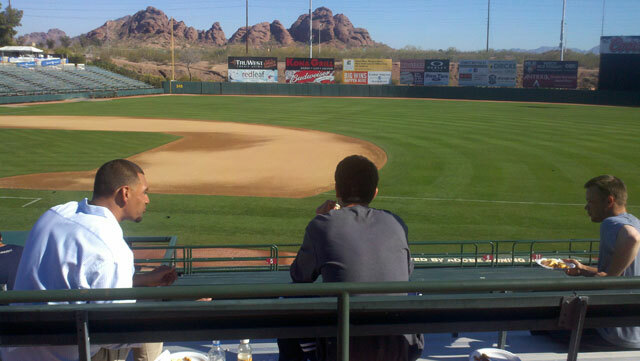 Phoenix Muni, spring home of the A’s, features a façade of mountain buttes beyond the left-field wall along with frequent howling, cawing, barking and possibly mooing from the adjacent Phoenix Zoo. 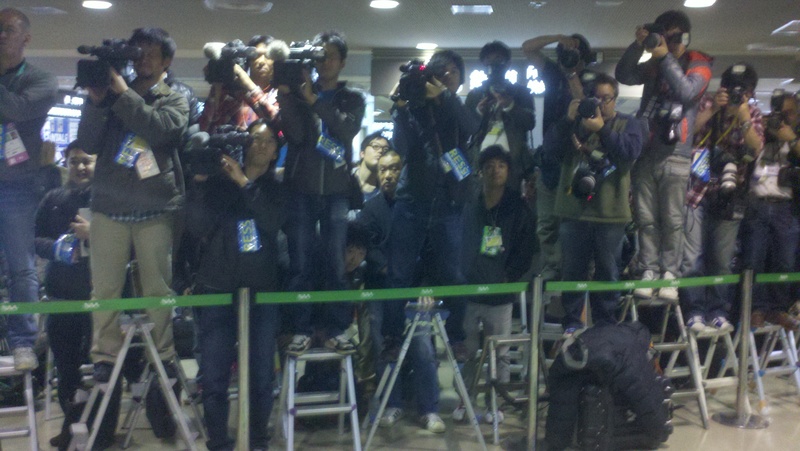 Walking through the gates, it didn’t take long to realize Major Leaguers don’t travel like the rest of us. Baggage check for Oakland’s team charter consisted of taping a luggage tag on your roll-away and tossing it onto a semi truck. No check-in line, no weight limit, no maze of sky elite/sky super elite/sky super-uber elite elasti-fences. A’s players — most with a significant other in tow — mingled on the bleachers in sweatpants and sunglasses while front-office types and league personnel assembled on the stadium concourse. Many a portion of cheesy eggs was consumed. At 10 AM, four busses arrived and security screening began. Again, this was a far cry from Laguardia at rush hour. No X-ray body scanners, no fumbling to remove belts or shoes and no vigorous upper-thigh pat-downs. Just a quick swipe with the metal detector wand and a glance in your carry-on. I think I even saw one of the TSA officers crack a joke. Couldn’t get my camera out fast enough to snap proof, but I swear it happened. We loaded up — players in Bus 1, on-field staff in Bus 2, front office in Bus 3, media and MLB folks in Bus 4 — and convoyed 15 minutes directly onto the tarmac at Phoenix Sky Harbor airport. 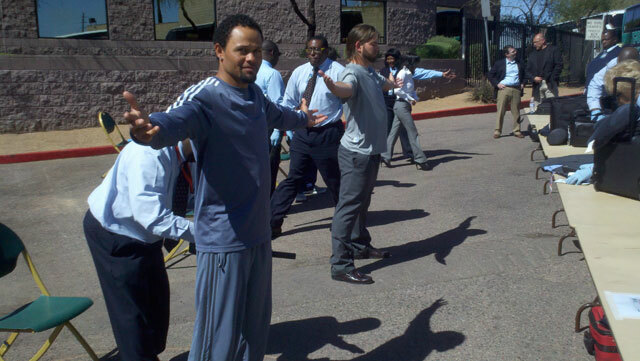 Even Coco Crisp has to go through security. Yoenis Cespedes boards the bird. Our home for the next 12 hours, an Atlas Air 747, was one big bird. Two levels with three cabins in each, the plane was nearly all business class with a roomy 2-3-2 seating arrangement. Guess who rode steerage in a slightly less roomy 2-4-2 behind the wing? Even so, this was luxury air travel. Each seat had a pillow, blanket and bag of trail mix waiting. And not the off-brand stuff — big leaguers get dried banana slices. Hot towels and mini toiletry kits arrived shortly after takeoff. Lunch and dinner were each four courses — if you count separate plates on the same tray as different courses. Mints followed meals and beverages were hand-delivered by flight attendants throughout. The A’s had essentially reserved a four-star hotel in the sky. Most players used the flight to catch up on some sleep before a busy week of touring and games. A few watched the in-flight movies (Crazy Stupid Love looked popular) or played video golf on their seatback TVs. The only real unexpected turbulence came when Tommy Milone had to change his shirt after a flight attendant accidentally spilled two full cups of ice water on him. Rookie hazing? Possibly. 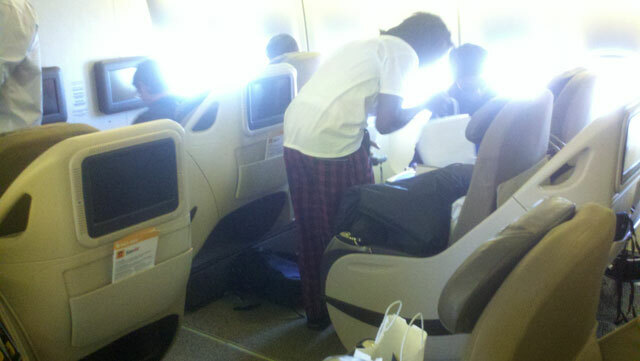 Yes, Jemile Weeks flies in red plaid PJ's. We touched down at Narita around 5 PM Friday local time, made our way through customs and a hoard of waiting Japanese media and bussed about an hour into Toyko. Roughly 25 hours after the day began at Phoenix Municipal — a day and a half including the time difference — the A’s had arrived. Tomorrow, Opening Series week officially begins. Looking forward to reading this blog Ian! be a enjoyment account it. Look complicated to more brought agreeable from you!